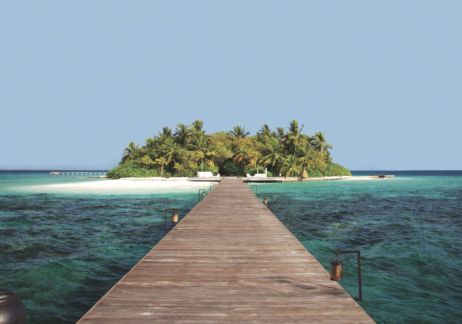 Kudadoo Maldives Private Island by Hurawalhi is a private island ideal for exclusive use. 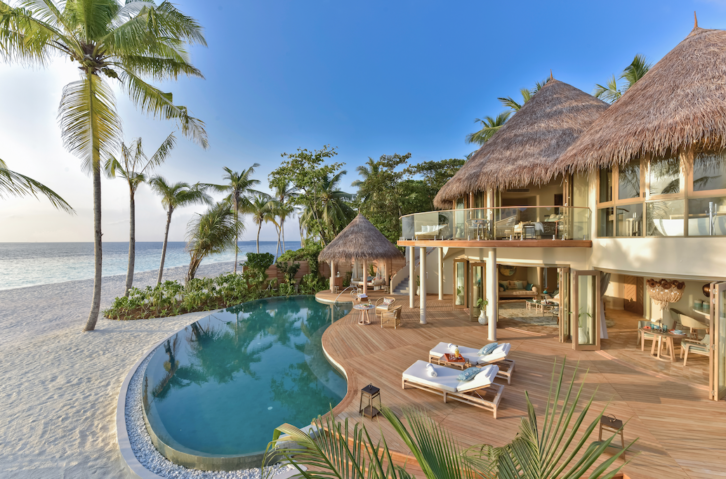 This idyllic island is comprised of 15 expansive overwater Ocean Residences, which opened at the end of 2018. Kudadoo is a private resort where everything is included; from fine dining to in-, on- and above-ocean adventures, and luxury spa treatments — a unique proposition for five-star-plus resorts in the Maldives. Kudadoo is purposely designed for exclusive rental, with additional facilities for guests’ personal staff. Kudadoo can be booked for friends or family gatherings, a couple’s getaway, private parties, weddings and other celebrations, or even for the ultimate business-incentive or client meeting. With an incredible unscripted dining offer — your wish is their command — and a fine wine list where all wines have a Wine Spectator rating of over 88, this is the private vacation of a lifetime. You can choose to dine in The Retreat (the central hub of this intimate setting), alfresco, in the privacy of your own residence or by candlelight on the beach. Your personalized experience begins before leaving home when your Kudadoo butler reaches out to help you plan your time on the island. The resort is defined by the philosophy “Freedom Reimagined” with dedicated butlers available 24 hours a day to meet guests’ every need, from private and effortless water adventures to endless luxury spa treatments, including access to the only Himalayan salt room in the Maldives. Designed by renowned architect Yuji Yamazaki, Kudadoo offers 13 one-bedroom Ocean Residences (each measuring 3,229 sq ft) and two two-bedroom Ocean Residences (4,090 sq ft), all with a 474-sq-ft terrace pool and some of the largest sundecks in the Maldives. Kudadoo also has private beaches and The Retreat, which is home to the bar, restaurant, games room, spa, gym and an expansive swimming pool and sundeck area, as well as the Sulha Spa. The sloped roof of The Retreat is an essential part of Kudadoo’s architectural statement, integrating solar panels and natural light into the design. The sun powers life at Kudadoo, enabling the island to be fully sustained by solar energy. Nightly rate $80,000 to $140,000 per night for exclusive use, depending on season. Room rates from $3,300 per night. Each residence offers undisturbed luxury including super-king-size beds, in-villa baths, as well as indoor and outdoor showers, Bang & Olufsen audio systems and IPTV (including Netflix and Spotify), unique to Kudadoo. It is purposely designed to integrate the exterior with the interior through open spaces and floor-to-ceiling doors, ensuring an unobstructed flow inspired by the resort’s surroundings. The Ocean Residences are the epitome of tropical chic with clean lines, earth tones and natural building materials that harmonize perfectly with the vegetation on the unspoiled private island. 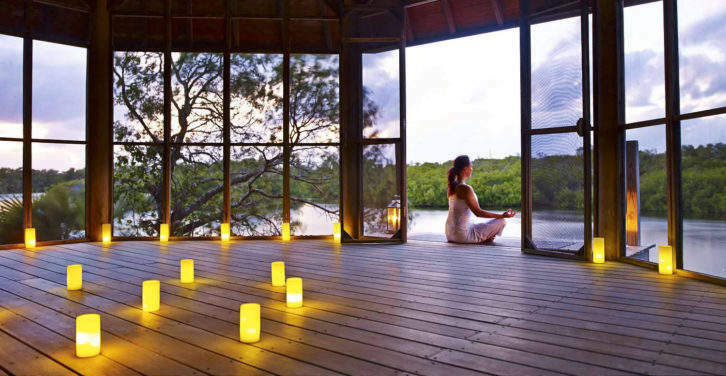 The Sulha Spa offers organic Healing Ocean products from Healing Earth, and signature treatments include Touched by the Ocean massage and Morning Light Rituals encompassing a beach yoga session. The Sulha Spa is defined by the mantra “connect to nature’s beauty, immerse your soul and transform your well-being.” It includes the only Himalayan salt room in the Maldives, a nail bar, a steam room, sauna and treatment rooms, as well as a fully equipped gym with a personal trainer, yoga instructor and meditation guru. Located at the Kudadoo’s sister property Hurawalhi, just five minutes away by boat, 5.8 is the world’s largest all-glass underwater restaurant, as much a fine-dining culinary delight as it is an extraordinary design masterpiece. Lunch or supper at 5.8 can be purchased as an addition to the vacation.